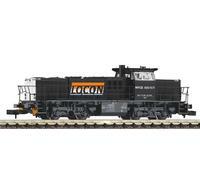 Since the 1920s, diesel locomotives have been a part of the worldwide railroad traffic. Two of the main reasons for the rising popularity of diesel locomotives over the years were that they required less maintenance compared to steam locomotives and that there was no need for an overhead contact line like with electric locomotives. We at PIKO offer you detailed and high-quality replicas of historic and current locomotives in different scales and product lines. N Soundloco Rh 2400 blau NS III + Next18 Dec.
N Sound Rh 2400 gray/yellow NS IV + Next18 Dec.